1. Heat a griddle pan. Toss the courgettes with 1 tsp of the oil, plus some seasoning. Griddle for 2-3 minutes on each side until charred and softening. 2. 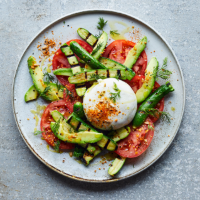 Put the courgettes, tomato and avocado onto a large serving plate and season. Sit the cheese in the middle and scatter over the dill. 3. Sprinkle 1 tsp dukkah over the cheese, and the rest over the vegetables. Open out the burrata, then drizzle everything with the rest of the extra virgin oil. Serve with garlic bread.